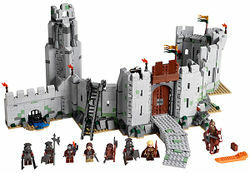 9474 The Battle of Helm's Deep is a set in the theme The Lord of the Rings released in May 2012. It contains 1368 pieces. It comes with Helm's Deep, a horse, siege ladder, one bomb and the Horn of Helm Hammerhand. It is the second-to largest set in the theme to date. This is where the battle between the armies of the elves of Lothlórien, the men of Rohan and the Uruk-hai of Isengard took place. The Elven Archers were along the Deeping Wall with Aragorn, Legolas, and Gimli, and the Rohan Soldiers were arrayed along the walls of the keep. However, the Uruk-hai planted a bomb in the culvert in the Deeping Wall and it was breached, allowing the Uruk-hai to flood through the breach. All the survivors of the Deeping Wall were called into the Hornburg keep, but Haldir was killed by a Berserker Uruk-Hai armed with an axe. The Uruk-hai brought a battering ram up the causeway to the gate and Aragorn and Gimli attempted to fight them off. However, the door is breached, prompting the defenders to retreat to the inner keep. As the defenders barricaded the door dawn broke, and Gandalf the White appeared with Eomer and his riders. The survivors charged out of the gate, and Gimli blew the Horn of Helm Hammerhand, causing the Uruk-hai to be struck with fear. Together they managed to push to the Uruk-hai back, forcing them to retreat. The Uruk-hai are killed by Huorns (Ents that have turned into trees), on their route back to Isengard. 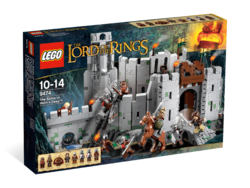 This set is the second largest set in the theme, behind 10237 The Tower of Orthanc. This set also contains a section of the Deeping Wall, as well as able to connect to the piece of wall in 9471 Uruk-hai Army. Haldir's armour is gold rather than silver. Haldir, Berserker Uruk-Hai and King Théoden are exclusive to this set. Théoden's horse is brown in this set. However, in the movies he is white and thus called 'Snowmane'. This is a description taken from LEGO.com. Please do not modify it. (visit this item's product page) Repel the Uruk-hai army at Helm's Deep! Facts about "9474 The Battle of Helm's Deep"